Can you believe the brown ball on the book cover is a mud ball? It is only made of earth. In Japan, it is called “dorodango (mud dumpling),” and making shiny dorodango is a popular play among children. 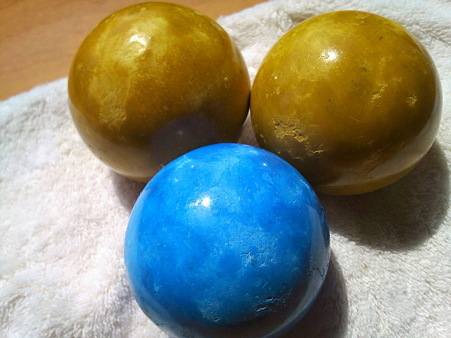 By using colored dirt or coloring the ball, you can make marble like dorodango too. You can see examples in the gallery at dorodango.com. Now you feel like making one to impress your children or friends? The good thing about this art craft is that you don’t have to buy anything! Basically you need dirt ans water, but it’ll be better if you have sieve to sieve sand. 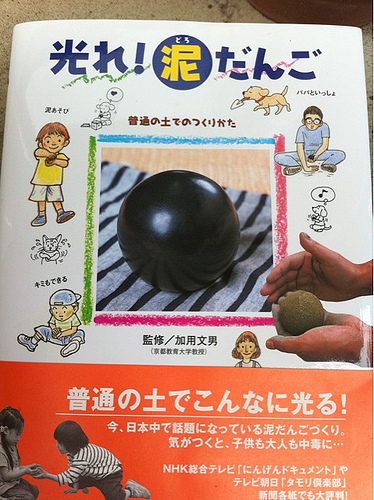 The video below shows how to make a shiny dorodango. You can skip the Dr. Dorodango and his assistant’s introduction part because the instruction starts at 1:10. 1. Mix earth and water. 2. Squeeze it in your hands. Drain. Squeeze well. 3. Put dry sand over it and make a sphere. 4. Put dry sand and gently stroke it. Repeat it till the ball gets smooth. 6. Sieve dry sand. Put the fine sand over the ball and stroke gently. Repeat it. 7. Put sand on your hands and stroke the ball till it gets shiny. What do you think? It seems simple enough. But it definitely needs patience.